NECSI president Yaneer Bar-Yam, prior to teaching a seminar for the U.S. Army Corps of Engineers in Washington DC, travelled to witness the efforts of the Corps in post-Katrina and Rita New Orleans. Paul Seguin, a strategic planner for USACE headquarters in Washington DC, accompanied Prof. Bar-Yam for the visit. The two met with deputy directors of Task Force Hope COL Greg Gunter and Mike Park, as well as other members of the task force. Task Force Hope was created out of the Corps' initial response to Katrina in which they provided emergency structures, facilities and infrastructure as well as debris removal. The task force was sustained after the inital response in order to rebuild and improve the levees. Its current mission is to deliver a comprehensive Hurricane and Storm Damage Risk Reduction System by June 2011, to reduce the risk of overwhelming the system to less than 1% per year. This goal is commonly known as a "100-year level of protection”, although this name gives a misleading sense of security. This primary agenda is augmented by additional, longer-term projects. Task Force Hope is a goal-based organization with a can-do attitude. In its offices digital displays are visible in every room, counting down by the second to when the mission of 100-year protection is to be achieved. Task Force Hope occupies a small suite of offices in the massive headquarters of the New Orleans district of the USACE. The New Orleans district, with a staff of 1300, is the largest district of the Corps. The staff of Task Force Hope, just six full time government employees, oversees the much larger Hurricane Protection Office and the Protection Restoration Office. Sites in New Orleans visited by Yaneer Bar-Yam: USACE Headquarters; Lower Ninth Ward; 17th St. Canal Gate; Lake Borgne Surge Barrier. In their meeting at the district headquarters, the Task Force Hope deputy directors briefed Prof. Bar-Yam on many different aspects of the operation. They described it as a massive project with unique constraints and opportunities. The operation requires integration of three areas: navigation, flood damage risk reduction, and ecosystem restoration. It has unprecedented full funding, at $14.45 billion, and the support of a nation eager to make New Orleans safe after the devastation of 2005. The deputy directors explained that the efforts are the responsibility of the entire Mississippi Valley Division of the Corps, with each district of that region providing design or other services for a particular sector within the New Orleans area, while under the overall program management of Task Force Hope. The deputy directors also spoke about the myriad technical problems and innovations involved in protecting a 350-mile perimeter by means of gated outlets and throughways, levees, floodwalls, and pumping stations. They discussed a review and evaluation of the decision-making processes of the past fifty years, and recommendations about how to improve the decision making in the future. Prof. Yaneer Bar-Yam and USACE strategic planner Paul Seguin at the 17th St. Canal, site of a notorious breach during Katrina. Following the meeting, Col. Gunter took Prof. Bar-Yam and Mr. Seguin on a tour of certain sites under the management of Task Force Hope. First, they visited a gate and pumping station at the mouth of the 17th St. Canal, the site of one of the most infamous breaches during Katrina. The canal, with a separate set of pumps at its other end, under normal circumstances drains rainwater into Lake Ponchartrain from low-lying portions of the city (formerly swampland). The new gate serves to close off the canal in the event of a storm surge pushing water south from the lake into the city at that point, as happened during Hurricane Katrina. The pumps, normally dormant, are for pumping accumulated rain water over the gate into Lake Ponchatrain when the gate is closed. The gate and pumping station observed by Prof. Bar-Yam has been built following Hurricane Katrina; it satisfies the immediate need for a “100-year level of protection”. Nevertheless, it is only a temporary structure, and at the time of the NECSI visit, the plans for the permanent structure had just been approved and construction was about to begin on an enclosed pumping structure and a gate farther out in the lake. Next Prof. Bar-Yam and Mr. Seguin visited the Lake Borgne surge reduction barrier spanning the mouth of the Inner Harbor Navigation Canal, where it flows into the Gulf inter-coastal waterway and the Mississippi River Gulf Outlet (MRGO). The Lake Borgne Surge Barrier is part of the ongoing work to relegate the old "parallel protection" levee system, which separates canals from settled areas, to a secondary line of defense. The primary defense will be barriers like the one at Lake Borgne, which block storm surges from even entering the canals. The new strategy is due to the history of failures along the parallel-protection canals, with devastating consequences. LTC (ret) Vic Zillmer, resident engineer of the IHNC Lake Borgne Surge Barrier, described the project to Prof. Bar-Yam. He discussed the engineering challenges of building a robust structure on marshy, silty ground underwater, and explained that a competition was fostered among industry designers to come up with solutions to those challenges. He then took Prof. Bar-Yam aboard the "Capt. Boogie" for a tour of the construction site. A canal has been dredged in the marsh to allow construction equipment to operate on barges, as the marshland cannot support heavy land-based construction equipment. In an effort to negate the environmental harm wreaked by previous destruction of swampland, the Corps uses materials dredged during their construction of the surge barrier to re-constitute areas of destroyed swamp. As part of the nearly two-mile surge barrier, three closable gates are being constructed in the barrier, to allow the passage of vessel traffic from Bayou Bienvenue and the Gulf Inter-Coastal Waterway. MRGO has been decommissioned and will be further blocked by the completed barrier. Work proceeds on the construction of the barrier as an assembly line of barges with different tasks move along the line of the barrier. In addition to his visit with the USACE and tour of their work sites, Prof. Bar-Yam independently visited the Lower Ninth Ward, the site of notorious levee breaches and tragic destruction during Hurricane Katrina, and of further flooding during Hurricane Rita. From a single vantage point, he could see overgrown lots where houses had been completely destroyed or swept away, as well as brightly painted, repaired, visibly inhabited homes. He could see damaged and boarded up structures lying abandoned as well as fantastically post-modern and innovative new construction going up. Nearly five years after the hurricanes' destruction, construction of new infrastructure was apparent. The juxtaposition of devastation and steadfast hope, of wreckage and renewal, attracts visitors to the Lower Ninth Ward, who come to see the reconstruction progressing and to pay their respects to the neighborhood. Upon his return to Cambridge, Prof. Bar-Yam shared with the local NECSI community his experience witnessing the accomplishments of Task Force Hope and the challenges facing it. The community anticipates positive collaboration between NECSI and the USACE in the future. 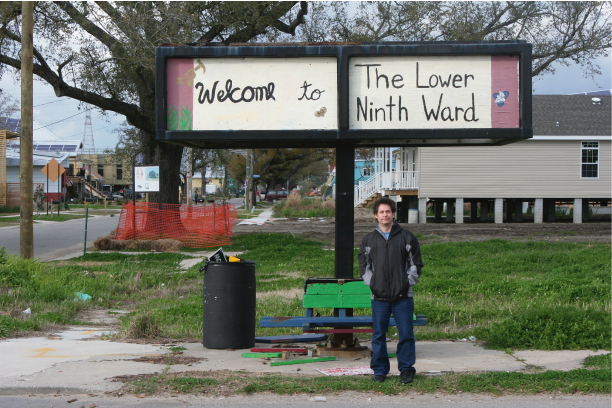 Prof. Bar-Yam visits the Lower Ninth Ward. 5) Active response through dynamically implemented methods of protection. This is present in the closure during a storm of flood gates and the Lake Borgne barrier navigation gates. It is also present in the possibility of diverting flood waters into the Bonnet Carré spillway. 6) "Soft failure" design so that the system does not fail catastrophically only incrementally at the point of failure. A small amount of flooding can occur without serious damage, as it occurs in many places. "Soft failure" design is present in the armoring of the back sides of levees, and the use of T-wall construction, which inhibit catastrophic failure when over-topping occurs. Authors: Yaneer Bar-Yam and Paul Seguin, New England Complex Systems Institute. Complex Systems Engineering Principles — Active Response and Soft Failure: A Visit to the US Army Corps of Engineers in New Orleans, NECSI Report 2010-09-01 (2010). 1. Y. Bar-Yam, About Engineering Complex Systems: Multiscale Analysis and Evolutionary Engineering in Engineering Self Organising Systems: Methodologies and Applications, S. Brueckner, G. Di Marzo Serugendo, A. Karageorgos, R. Nagpal Eds. (Springer-Verlag Berlin, 2005), pp.16-31. 2. Y. Bar-Yam, Engineering Complex Systems: Multiscale Analysis and Evolutionary Engineering, in Complex Engineered Systems, D. Braha, A. Minai, Y. Bar-Yam (Eds.) (Springer, Berlin, 2006). 3. Y. Bar-Yam, Making Things Work (NECSI Knowledge Press, Cambridge, MA, 2005). 4. M. Lim, R. Metzler, and Y. Bar-Yam. Global Pattern Formation and Ethnic/Cultural Violence, Science 317, 5844 (September 14, 2007). 5. Y. Bar-Yam, Multiscale Variety in Complex Systems, Complexity 9 (2004). 6. H. A. Simon, The Sciences of the Artificial, 3rd ed. (MIT Press, Cambridge, MA, 1996). 7. Y. Bar-Yam, Dynamics of Complex Systems (Westview Press, Boulder, CO, 1997) Chapter 2 . 8. Y. Bar-Yam, I. R. Epstein, Response of complex networks to stimuli, PNAS 101, 4341-5 (2004). 9. Y. Bar-Yam, Complex systems engineering principles — active response and soft failure: A visit to the US Army Corps of Engineers in New Orleans, NECSI Report 2010-09-01 (2010).